Bloom Magic cultivates partnerships with the finest florists in Ireland to bring you exclusive designs and arrangements that you won’t find anywhere else. If you have experienced the joy of receiving fresh and vibrant blooms you will know the wonderful impact it can have on your day. We are proud to offer you an easy and convenient way to spread the gift of bespoke flower delivery throughout Dublin and Ireland. For the low price of only €12, Gold Club Members receive unlimited FREE standard delivery on all orders from Bloom Magic for the next 12 months. There are no limits on how many free flower deliveries to Ireland and Dublin you order. The moment you order your second artfully arranged bouquet your Gold Club Membership has paid for itself. Joining the Gold Club is simple, explore our collections and arrangements and when you find the perfect bouquet just check the 'Join our Gold Club’ box. That’s it! You will see Gold Club in your secure checkout along with the blooms of your choice; what you won’t see is a delivery fee for the next 12 months for your next-day flower orders! 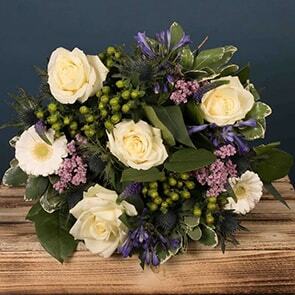 Because everything you order from Bloom Magic is covered by our quality guarantee you can be sure to receive only the finest flowers from talented Irish florists who go to great lengths to source locally produced seasonal flowers whenever they can. With free flower delivery anywhere in Ireland why not treat yourself to a regular delivery of vibrant and unique flowers to your home or work place? Our commitment to using minimal, eco-friendly packaging means that you don’t need to worry about excess waste, just enjoy beautiful, fresh-cut and hand-tied flowers delivered to your door for free. Interested in our Gold Club membership for your business? Visit our dedicated Corporate flowers and gifting service to find out more about what kind of flower delivery to Dublin and Ireland Bloom Magic can offer.